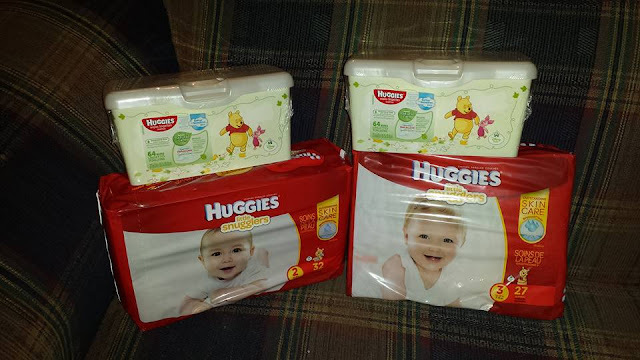 *Disclaimer - I received the products in this post from Huggies in order to facilitate this review for my readers. Are you looking for a good diaper brand that you can trust? I just had our little one on March 27, so she is still using newborn diapers. She is a little bit under 9 lbs right now, so newborn size still fits decent. We'll be going into size 1 soon though. You can buy Huggies Little Snugglers diapers, here and pick the size or sizes you need. We bought a couple packs of the Huggies Little Snugglers size newborn so we could have the dip in the belly button part of the diaper for the cord stump which is SUPER helpful for newborns during the first two weeks of his or her life until it falls off on its own. I highly recommend Huggies Little Snugglers. I received sizes 2 and 3, which will be used as soon as she's able to fit into them of course. We have used half of one wipe pack so far and I love these wipes. They're soft and smooth for little ones for diaper changes. You can buy these wipes, here. What I like so much about these specific wipes is that you can buy refills for it and just put the wipes in the containers to reuse them. These are great for on the go too, as well as just sitting on your dresser as needed for diaper changes. I have a friend who uses cloth diapers with her little one. I don't have a kid of my own yet, but you can BET I'll be running toward Huggies when the time comes. Parenting is already hard enough, no need to make it any harder! I use cloth diapers but if my child does need to be in disposables for runny poops from illness or antibiotics I do go to Huggies! They are a great brand!! I can definitely see those wipes being super handy when you have little ones. Huggies has always been super reliable for us. I used cloth diapers, but LOVED the Huggies wipes. There is nothing that compares! We used Huggies on all four of our kids. My twins are four now and out of diapers but we still have those wipes in the house for quick clean-up! I love Huggies wipes. Even though our boys are big now, we still use them for a variety of things around the house. huggies was my favourite brand for the kids while they were growing up.